Beetroot Ricotta Gnudi in a Sage and Butter Sauce. 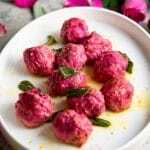 These Italian dumplings look so impressive with their bright pink colour but don't be fooled they're super easy to whip up and are perfect for date night or a special occasion. Wrap the beetroot in foil. You can cut the stalks down to 2cm (about 1 inch) but don't be tempted to cut more or peel the beetroot or it will bleed and you'll lose the vibrant colour. Place the wrapped beetroot in the oven and roast for 45 minutes or until cooked through. Carefully open the foil and let it cool. The skins will come off very easily (you might want to use gloves) from the cooled beetroot, remove them and roughly chop the beetroot. Place in a food processor or use an immersion blender and blitz to a rough purée. Add the ricotta, egg, parmesan, nutmeg, lemon zest and a good pinch of salt and pepper to a bowl and mix to combine. Add the pureed beetroot to the ricotta mixture and mix to combine (don't worry if there are some small chunks of beetroot in it). Sift in the flour and mix to combine then cover with cling film and place in the fridge for 1-2 hours. After the mixture has chilled, bring a large pot of salted water to a boil. Using wet hands (important) roll the gnudi into balls around 1 tbsp of mixture at a time and place on a plate or tray lightly dusted with flour. Place the gundi in boiling water, when they rise to the surface they're done. Meanwhile melt butter in a frying pan until bubbly, add sage leaves and fry for a minute then add the cooked gnudi. Toss in the butter and serve with a grating of fresh lemon zest and a small sprinkling of salt. Beetroot will stain your hands when peeling the skin so wear gloves if you can. Use unwaxed lemons for the zest. If you leave the mixture for longer than 1-2 hours you might notice juice from the beetroot leaking out from the ricotta simply mix it back together to combine again. Because the beetroot juice does separate I don't recommend you shape the gnudi into balls in advance, do it just before cooking. Always use wet hands when shaping the gnudi to stop them sticking to your hands. When the gnudi rise to the surface of the water they are ready. They take longer than store-bought gnocchi they'll need around 3-4 minutes. Serve the gnudi immediately when they are extra light and delicious. Leftovers won't be as light. You can easily double this recipe to serve more people.